5 Cheap, Best Automatic Watches 2017 | Affordable Automatic Watches! If you are looking for best cheap automatic watches, then you are in the right place. 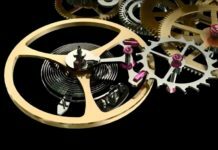 First of all, many of us commend the complex engineering and high quality of craftsmanship that goes into the best automatic watches. Knowing the fact that many tiny components work together to power itself, it always feels good to have a self-driven perpetual machine on your wrist. This intricate time machine will come with the reasonable cost. 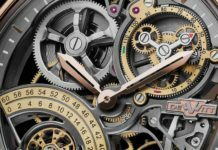 Especially, when you are looking for cheap and yet great automatic watches, it can be a very tedious job to find the timepiece that stand-alone and is dependable at the same time. 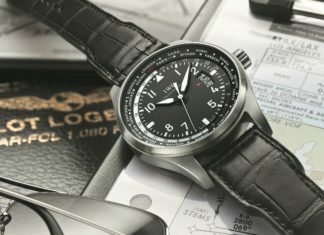 Well, in our list we have presented with 5 best automatic watches that are cheap and that gives you the maximum value for your buck. 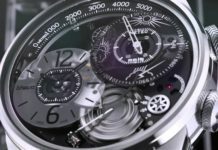 After going through a lengthy process of selecting, we have concluded that the following affordable automatic watches are the best in their price segment. All our listed watches have been appreciated by many of us, for its design, fit, finish and most importantly its accuracy and durability. If you are under the impression of reliable automatic watches demands high prices, then going through our list will certainly provide you with a show-stopping blend of high quality within affordability. If you are looking for an affordable automatic watch with multi functionality, but don’t want to spend more than 100 dollars, then look no further than Invicta Men’s 89260B. Priced under $100, it’s an inexpensive watch that will definitely exceed your expectation. Further, Invicta Men’s 89260B has a case diameter of 40mm with 20 mm thickness. Its beautiful face dial featured vibrant black background, luminous hour markers, minute tracker on the outer rims, magnifying glass for date display and luminous hands. Its multilink stainless bracelet is adorned with a fold-over clasp with safety. 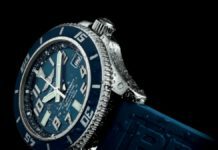 With functionality like screw-down crown, radiant unidirectional bezel and compact mineral dial window, this watch is ideal for deep sea diving. It is water resistant to 660ft. 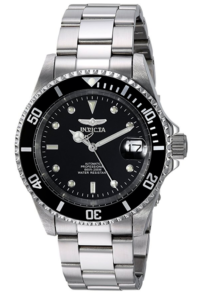 Invicta Men’s 89260B’s accuracy and durability has been well liked by many of its owners. 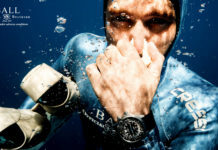 Furthermore, its Rolex submariner like design and incredible automatic mechanism has been its best selling point. With the price tag little over $50, Seiko Men’s SN809 is the best entry-level automatic watch. Don’t let the price underestimate its features. 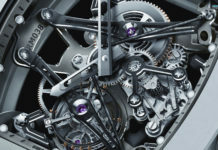 It has everything that a standard watch should have plus intricate engineering of automatic movement. Its stainless steel case is 37mm wide and 11mm thick. Its round analog black dial feature Arabic minute marker in the outer ring, hour marker in inner rim, date window at 3 and luminous hands. Furthermore, it is furnished with nylon band with buckle clasp. Seiko Men’s SN809 has been the automatic watch of choice for many of us. Its handsome look and automatic movement will certainly steal your heart. Thus, considering its price tag and all the features that it offered, we have listed this watch as the best cheap automatic watch. The Orient Men’s CEM65001B is the perfect blend of high level of craftsmanship and affordability. Although the brand Orient seems unfamiliar to many of us, it is the fact that Orient is the largest Japanese mechanical watch producer. Unlike other watch companies, Orient actually produces its own movement. It is 100 percent Japanese! None of its production channel is outsourced. For this fact, Orient holds the prestigious title of “The True Watch Maker”. Its case is 41mm wide and 13mm thick. It is a round analog dial with sleek black background, luminous hands, and date window at 3. Also, this watch comes handy to all water lovers. 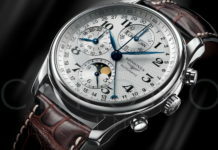 It featured unidirectional bezel with luminescent minute marking, and screw-down crown. While it can resist water pressure up to 200M, its robust design make this watch undeniably one of the best automatic watches. 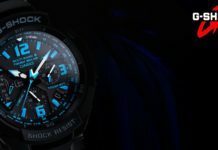 If you are shopping for accurate and dependable automatic watch and willing to spend little more than $150 but less than $200, then Seiko Men’s SKX007K2 might best fit your sense of style and it is the best automatic watches under 200 dollars. 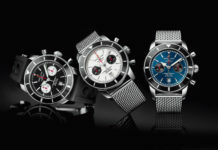 While buying any watches, the size of the watch is one of the most dominant factors that influence your buying decision. With the case diameter of 42mm and thickness of 13mm, Seiko Men’s SKX007K2 featured one of the most preferred size among men. 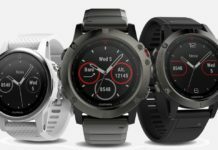 Further, its black analog dial face display, luminous dot hour marker, arrow-shaped hands, date & day display at 3 and white minute tracker on the outer rim. 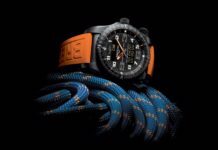 In addition to all these features, Seiko Men’s SKX007K2 is a robust dive watch. It is an ISO certified divers watch. Its outstanding unidirectional bezel with white minute & hour tracker provide accurate and reliable time for divers. Furthermore, the blend of pushdown crown and hardlex crystal window armed this watch to withstand vigorous water and land actions. Hence, considering all these features, we have concluded Seiko Men’s SKX007K2 as the Men’s watch under $200 that you can consider the best automatic watch under $200. You might also want to take look at our $200 collections! If you are looking for a watch that is powered by the legendary Swiss movement, but you are shopping with a limited budget, then we believe Invicta Men’s 9937 Pro Driver is the one for you. You can get this beautiful timepiece under $300. It is the premium version of the Invicta Men’s 89260B. In fact, this is one of the best watches of Invicta so far. When you have a Swiss automatic movement, you can expect this watch to be one of the best in term of accuracy and durability. Also, with its outstanding water resistant to 600 feet, screw-down crown and flame fusion dial window, it is one of the best dive watch. Further, it has the transparent back where you can see its magnificent movement in action. Hence, this is one of the best automatic watches under $300. 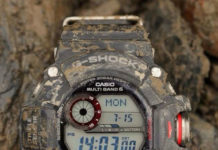 You might also be interested in our list of the best hiking watches! Finally, thank you for choosing our article. We hope our article about 6 best cheap automatic watches was helpful to you. Our team will sincerely appreciate your comments, views and ideas. Please feel free to reply. Best of Luck with your purchase of the best budget automatic watches.